The Earthquake Sound MiniMe P63 Subwoofer is a sub-atomic sized, ultra-powerful subwoofer that's elegantly crafted in high gloss piano finish with beautiful, grill less flush-mounted drivers on 3 sides. The MiniMe P63 is designed for people who love music and movies at full throttle without bulky equipment in the living space. At less than 9” on all sides, the P63 is easy to place on a low shelf, beneath a table, behind furniture or in a corner. The incredible performance of the MiniMe P63 is achieved through the symbiotic relationship of the TCT enabled 6.5” premium XLT active driver, and two 6.5” passive radiators coupled with the massive power of a 500 watt Earthquake enhanced Class D amplifier. The implementation of dual passive radiators drastically increases the capability and efficiency of the system resulting in ultra-low frequency reproduction at louder sound levels than previously achieved by any manufacturer at this size. PMT :(Piston-Max Technology) A patented Earthquake technology that enhance acoustical output while keeping a minimal footprint. Piston-Max moves the speaker surround to the outer edge of the cone body, resulting in 20 percent increase of surface area. This translates into more sound and higher efficiency. XLT : (eXtra Long Throw) A woofer geometry originally developed by Earthquake for heavy duty industrial subwoofers to expand excursion potential over regular long-throw woofers. XLT and PMT work in great synergy as each technology expands on one of the two parameters for sound generation - Bore and Stroke. The level of sound possible is determined largely by Bore times Stroke. Ask any car buff and they will say there is no replacement for displacement. Passive radiators increases sub-harmonic frequency response and dynamic output capability. They overcome the limitations known from conventional closed and ported designs that prevent radical excursion and deep response. The powerful XLT active woofer is pneumatically coupled to the passive devices - enabling battlefield level effects to be reproduced effortlessly. Designing the MiniMe P63 was a fun and challenging process. Other manufacturers have previously attempted to build subwoofers in the 6.5 Inch form factor, but with limited success. Scaling down a subwoofer while retaining performance is immensely difficult - it all comes down to physics. As anyone with understanding of how American Muscle makes power will tell you, ”There is no Replacement for Displacement” while “Decal-Tuning” looks cool in the parking lot, it gets you nowhere at the dragstrip. Some attempts were merely novelty subwoofers without any sliver of performance or they were 1000 Dollar bling boxes with “2000” watt amplifiers utilizing drivers of only 5 inches of radiating surface that helplessly failed to grab the air even with when pushed beyond Xmax. Being an engineering driven company, Earthquake Sound can not simply regurgitate past attempts, we had to blaze our own trail and make something that actually works. 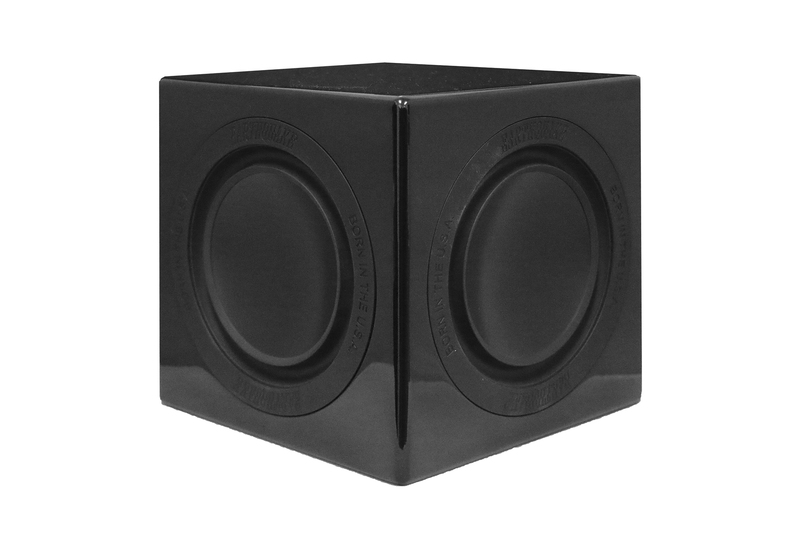 It was our goal that this subwoofer should be less than 9 inches on all sides (smaller than any other manufacturers 6.5 inch form factor subwoofer) and that its performance should rival competitive brands subwoofers in the 10 inch class, and be equal to our own MiniMe P8. Back to the physics, the only way to make this happen was to get the same Bore X Stroke cubic inches as the larger woofers. No fancy technobabble or waiving of magic wands would do. Our existing lineup of MiniMe Subwoofers utilize one active driver and one passive, this is a superb combination, however for the P63 we had to go one step further and add a second passive radiator. This had many benefits: first and foremost, it increased the total sound radiating surface by 50 percent. It also increased overall system efficiency since the total air resistance on the active driver was reduced and it could thus reach its designated Xmax with a lot less power from the amplifier. This also reduced compression resulting in overall sound quality improvement. It further solved a rather comical problem we encountered early in the development phase when the subwoofer only had one active and one passive. The issue was that due to its small footprint and relatively low weight, the power and inertia of the drivers would actually flip the subwoofer on its head with either the active or the passive facing against the floor. This caused the subwoofer to violently jump across the floor until the power cord was ripped from the socket or the subwoofer was destroyed by impacting the floor. Many harebrained schemes were suggested as possible solutions for this, from velcro the unit to the floor - to a vacuum assisted suction cup that would be electrically activated by a tilt meter so when the sub sensed that it was about to tip, a small internal vacuum would blast into action and keep the sub sucked to the ground. Adding the third passive radiator solved all this as it balanced the subwoofer and the axis of operation for the passive radiators was changed 90 degree from the active driver. Scoring up : we had gotten significantly closer to matching the Bore of our MiniMe P8, but still quite not there. Flipping through our Rolodex of patents it became obvious that we had already invented the solution years past with the Piston-Max technology that is used throughout our car component drivers. It is a special way of mounting the driver surround to the underside of the cone and the outside of the chassis resulting in a 20 percent increase in sound radiating surface area. Looking at the drivers in the MiniMe P63 it is easy to see that they are made in a different way than our other woofers. The result is that the MiniMe P63 has more sound radiating surface in relation to its total surface area than any other subwoofer on the planet. This solved the Bore side of the equation. For Stroke we used our XLT (eXtra Long Throw) woofer geometry, it uses extended depth chassis with bumped back pole piece and thicker magnets to allow excursion beyond that of traditional long throw drivers. We further beefed up the driver by adding our TCT (turbine cooled transducer) technology. TCT is known from our large industrial subwoofers so scaling it down to fit the P63 was a first. TCT works by forcing the air from the pole piece through a turbine aperture that cools the voice coil directly in a uniform annular pattern. Bore X Stroke now matched up with the MiniMe P8 then comes the issue of power - how much ? The marketing people jumped out of their cubicles and were screaming for 3000+ watts as that would best any competitor and be an awesome advertisement. Unfortunately for them the President and Chief engineer of Earthquake is one and the same so they were quickly shut down and returned to their cubicles. Not that he is not a proponent of insane solutions as long as they are of sound engineering. The right amount of power is the amount of power needed to drive the woofer to its Xmax. More power has no purpose other than to create heat and inflate the cost of the subwoofer. Careful measurements with laser range meters ascertained that 500 watts would drive the woofer to its Xmax. Our MiniMe P8 reaches Xmax with only 320 watts, the difference is an expression of the efficiency inherent to larger woofers. The 500 watt Evolved class D amplifier has an efficiency of 90% which means that the amplifier does not get warm even in harsh and continuous operation. Earthquakes unique Class D design is distinguished by high performance and superb bass control. Even the most complex source material is reproduced accurately and articulated.